In 2013 we bought a small 5 acre island in northern Wisconsin near Hayward, WI. There is a rustic log cabin on the island with minimal amenities (no electricity, no running water, heat from a wood burning stove and an outhouse). Now you may be asking yourself (as we did), why would you want to buy something up north where the winters are frigid when all of our friends are buying condos in Florida and southern California? It’s difficult to explain except that the cabin is actually in very good shape and the surroundings are spectacular. It is on a lake that is relatively unpopulated with a scattering of other cabins. In the winter we snowshoe over the ice pulling a sled with our supplies while the rest of the year we have a pontoon boat to go across the lake. Our first trip to the island was in late December of 2013 and there were several days in which the temperature dropped into the -30 deg F range at night. Since there’s no electricity, mostly we use candlelight at night. Of course in the winter we depend on the wood burning stove to provide heat. When we first arrive to the cold cabin, it takes 4-5 hours before the main room warms up enough for us to take our coats off. Usually we don’t sleep in the bedroom since it is farther away from the stove. Fortunately there is a sofa that converts to a bed in the living room which is cozy next to the fire. Of course, the fire goes out after we sleep so either someone has to throw a log onto the fire in the middle of the night or we need to stoke up a fire in the morning. We really haven’t made any friends with our neighbors on the lake, partly because we really don’t see them since the cabin is on an island. However, this north woods community is not diverse at all so I am sure that our Asian faces are noticed in town. On one of our winter trips to the island, we were about to leave for home when out of the woods appeared a tall figure. Initially it was quite a shock since we had never seen anyone else on the island. But this fellow had a police uniform on and introduced himself as a police officer. He said that the office got a call from a lady who lived across the lake and reported that smoke was no longer coming out of our chimney that morning. Since the weather was very cold, she was afraid that something had happened to us and wanted the police to check it out. So for sure, our neighbors are looking after us, even though we haven’t met them! The island is a great place for Maple since we can pretty much let her run free without having to worry that she will bother the neighbors. There is some danger that she will swim out to greet any fishermen who try to get too close to the island. She loves to swim in the little area off the pier, usually spending her time chasing the minnows that she can see, but cannot catch, in the water. In the wintertime she seems impervious to the cold and snow and loves to frolic on the ice. On our island the only notable inhabitants are a pair of nesting bald eagles who had a large nest on a tall pine tree the year that we bought it. They raised two eaglets that following spring and summer, but in the fall a large storm blew the nest down. 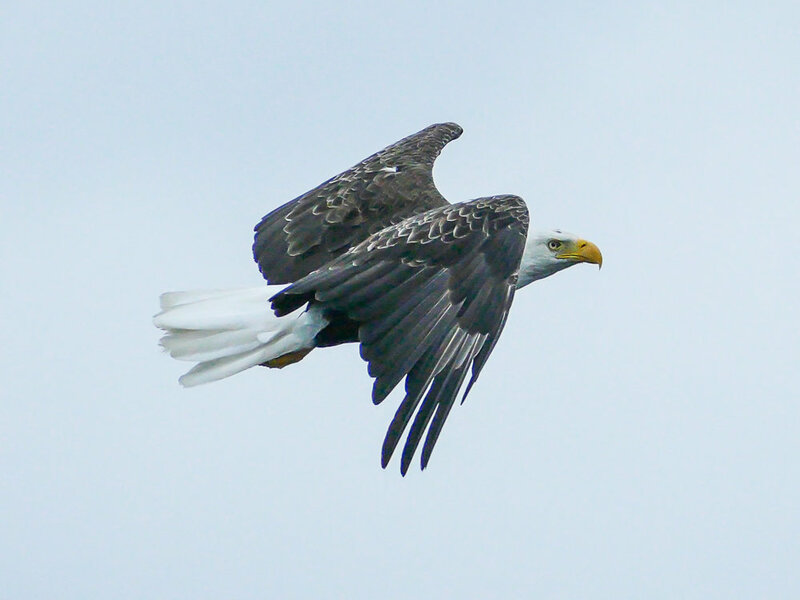 However, the eagles stayed in the area in future years and built a nest on the mainland across from our island in the winter. They have successively raised eaglets every year except one, as far as we know. Of course this assumes they are the same birds which we have no way of confirming. In the meantime we are learning a lot about eagles. Back home I have previously followed for about 5 years a pair of red tailed hawks who had a nest on my bike route to work. I read up on hawk behavior at that time and some of the observations on these eagles extrapolates from what I learned about hawks. The parents do not seem to spend the night either on the nest or near it except when there are eggs to incubate and very young eaglets to feed. They remain in the area in the winter and check in almost daily on the nest or on their favorite roosts near the nest even though our lake freezes over so there is no open water for fishing. There must be an area with open water, perhaps near a dam with a spillway, where they can catch fish for sustenance over the winter. Even in the winter they will sometimes spend hours just roosting on a branch near the nest, perhaps to keep the claim on the very large nest from other eagles who might appropriate it. However, they don’t seem to use the nest to sleep overnight, even though the northern Wisconsin winter nights can be frigid. Perhaps the most surprising thing for me is that the parents maintain the same behavior even in the summer when the lake is available for fishing. Only twice have I seen the parents fishing on our lake. On the other hand when there are young eaglets to feed in the nest, they often fly in from some distant lake with lunch in their talons. They don’t seem to overnight on the nest unless they are incubating eggs or the eaglets are very young. For most of the years the eagles have successfully raised one or two young eaglets. They are typically born in early spring and remain in the area until the fall. They usually fledge in July but will stay around the nest still dependent on food from the parents. Oddly, the parents do not hang around the nest except when sitting on the eggs or making a food drop once the eaglets hatch. 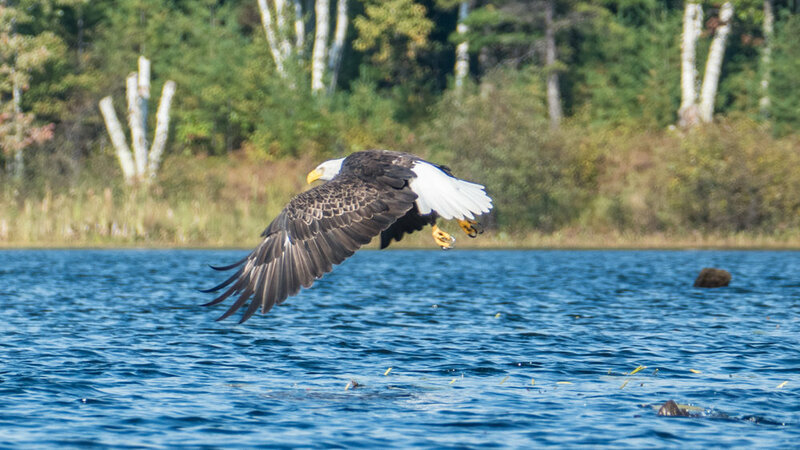 As noted above, we rarely see them hunting on our lake and we do see them flying in from somewhere else with a fish in their talons, presumably from some other lake. Once the eaglets hatch, then we see a lot more of the parents as the eaglets are usually very hungry and vocal so it’s hard to miss them. In 2018 we had an interesting and very improbable experience. That year there was only a single eaglet and when we were at the island in late July we never saw it out of the nest until one day when it appeared on a pine tree on the island. Undoubtedly, it had fledged and had flown over to our island. 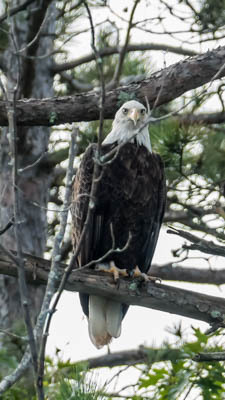 The next afternoon, it was again out of the nest and sitting on a tall pine tree on our island. Since it was around dinner time, we expected that we might see a parent come in with a food drop. So we decided to bring our dinner aboard our pontoon boat and have dinner on the boat while monitoring the eaglet’s activities. As we were watching the eaglet and eating our dinner, the sun started to set and a nearly full moon started rising in the east. I joked that it would be something if the eagle would fly across the face of the moon but I didn’t think it would really happen since it was so improbable. Most pictures one sees of birds or planes flying across the moon are shot with considerable distance between the subject and the camera which allows a bit of time to take the shot. In this case we were 40-50 yards from the eaglet so there would be little time for preparation. I decided to take a movie instead of shooting photos and take screen grabs from the movie. My camera, a Panasonic Lumix FZ1000, has 4K video with reasonable resolution. In any case the eaglet did finally leave its roost and flew across to the nest and I was able to capture it on video as you can see below. Of course I wouldn’t be telling this story if the eaglet hadn’t actually flown across the moon. In the few seconds that it took for the flight, I didn’t actually realize that it had taken the improbable flight path until I looked at the recording afterward. I sent the photos to my kids and grandkids and commented on how this was a result of luck and patience. I was extremely lucky that not only did the eaglet take a flight path that happened to cross the moon, but also that the day happened to be just before a full moon, so the moon was rising before the sun set, giving enough light to see the eaglet. And we had the patience to wait for about an hour and a half for the improbable event to occur. Here we are having dinner on the pontoon boat while monitoring the eaglet, which can be seen on the pine tree to the far right. The eaglet is on the pine tree on the left and the nearly full moon is rising slowly at the far right. Sequence of the eaglet flying across the moon from screen grabs of the movie. Time between each view is .067 sec so the total time from the first to last image is .only 1/3 of a sec. The images were stitched together with Photoshop. Slow motion (20%) movie of the eaglet flying across the moon. Actual total time of the video was about 7 sec. It happened so fast that I didn’t realize it had actually flown across the moon until I looked at the video. The other common birds on the lake are loons. They are beautiful diving birds and there is usually at least one nesting pair with possibly others on the far side of the lake. They have an incredibly haunting call and yodel both during the day and sometimes at night. Lil caught a largemouth bass!